It is possible to better serve you and give you advice in establishing your business in Canada by understanding who you are, what your experience is and what your goals are. Information about your business: Before we advice you, we take the time to meet with your team and examine your company to better understand how to well set up your business in Canada. You have acquired relevant business experience, you have business goals, you are looking to invest in Canada in areas in which you feel more comfortable than others, such as: the purchase of land for a new real-estate construction project, the purchase of buildings for renovation and resale, buying companies or even the creation of a new business. Construction Daniel Dargis Inc. is a construction business consultant who gives you the tools and helps you to obtain contracts and projects. Information in Canada: Construction Daniel Dargis Inc. collects relevant current information, in the field, and under the watchful eye of a construction expert and consultant in project management to allow you to make the right decisions. This information comes from a construction business consultant network encompassing experts in construction and real-estate, such as: a lawyer, a tax expert, an architect, an engineer, a real-estate developer and landowning suppliers of land. 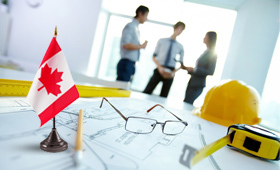 Your investment projects in Canada are important and deserve special attention. We go further than just putting you in touch with real-estate agents or giving you advice. We go to the source to put you in contact with the decision makers. As and when we collect the information in Canada we work closely with you and your team of construction experts to guide you better and advice you in your business ventures in Canada. If necessary, we organize meetings and training sessions tailored to your needs with experts in: business law, finance, taxation, construction, real-estate, project management, marketing and sales, and other topics of interest to better advice you and then move into action. Construction Daniel Dargis Inc. is more than just a construction company and a construction business consultant. This is a group of experts that collects information and coordinates training sessions to then help you make a thoughtful decision leading to investment, corporate business and real-estate projects in Canada. To inform you, give advice to you, provide tools and resources to buy or start a business in the areas of construction and real-estate projects and then obtain contracts and projects in Quebec, Canada, we are at your service.